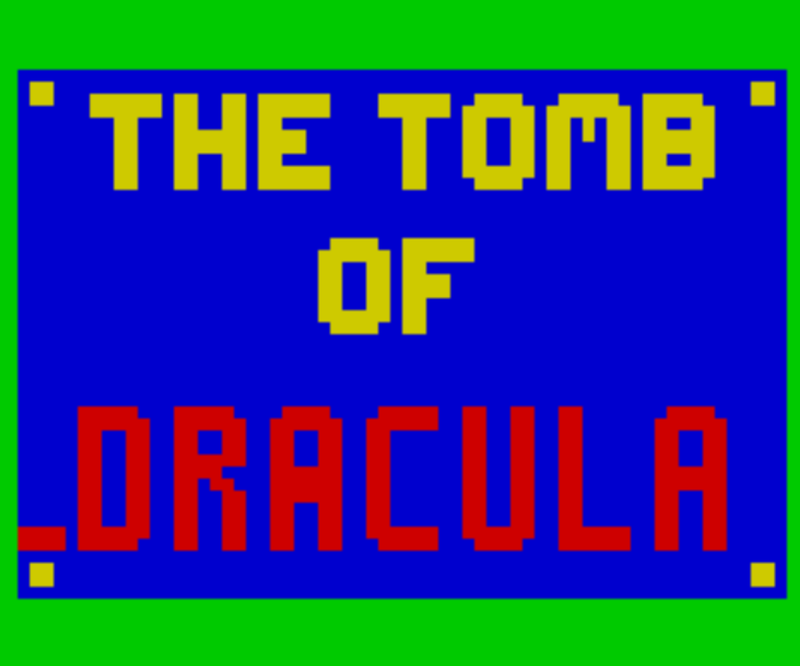 Ooh, the tomb of Dracula! Am I meant to be scared? Well yes, I actually am. Vampires are not that scary anymore. Too busy making sure their hair looks good rather than looking for their next victim to sink their teeth into. Shame. Remember when vampires were creepy? Just watching the original Nosferatu film will put the willies up you. Argh! The long face, ghastly teeth, long finger nails, those hypnotic staring eyes - you knew that that face would be the last thing you'd see before you died. Now, he's more likely to ask you out for a coffee. You ok, mate? You look a bit peaky. 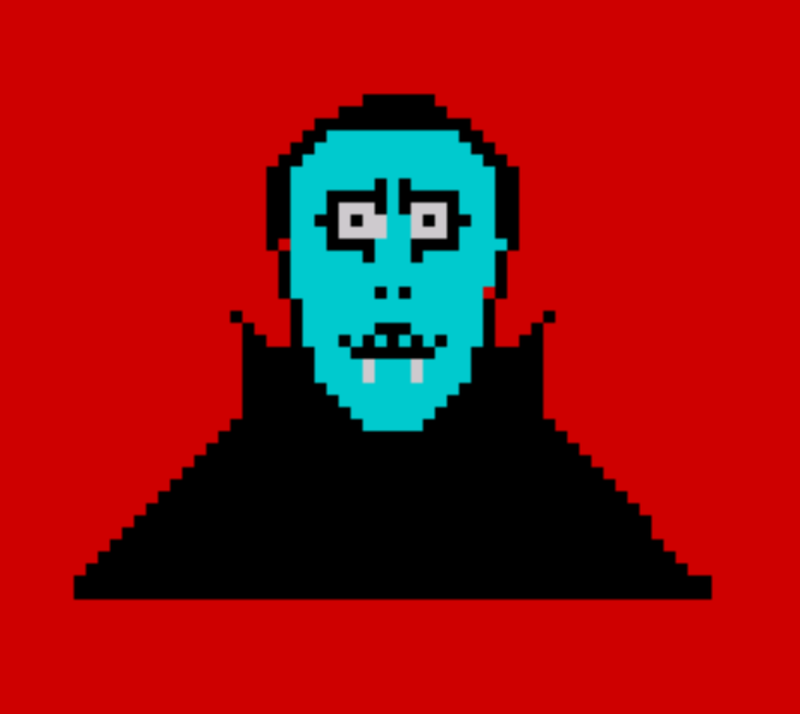 If, like me, you're a bit older, you'll be more akin to the classic vampire (and no, I'm not saying I was around when Nosferatu was kicking about - how dare you! ), slicked back hair, high collar, pointy teeth (or was that Danny Zuko?) and flowing cape, ie. the best kind of vampire; this is what we're dealing with here in The Tomb of Dracula. There's more than a passing resemblance to Christopher Lee (aside from the blue face) but that's a good thing. This is the kind of vampire we all love! As you can see from the above, he really is quite creepy (I think so anyway!). I think the crudeness of the image which looks like has been made using the Speccy's built-in graphic sprites, really adds that little extra to the portrait. I mean, just look at those eyes - creepy. 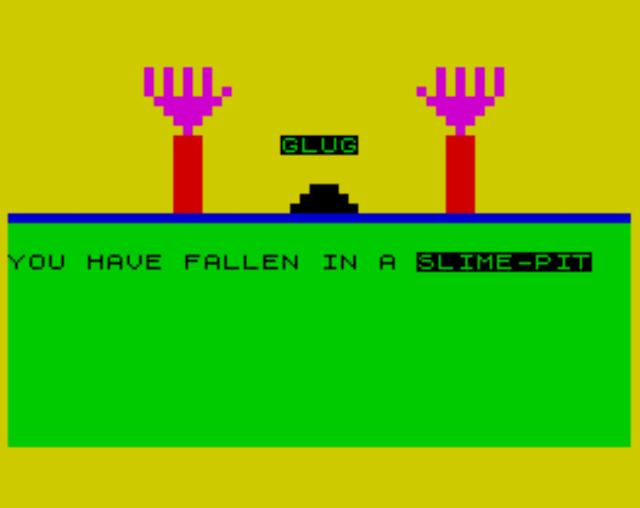 It certainly had me irked seeing that when I was a kid playing this. ...advice that I should have heeded when I was in school. Well, what do we have here? You've decided, whether it was for the best or otherwise, to enter Dracula's tomb to get hold of his treasure that he has buried somewhere in there. In fairness, you must be damn desperate to get hold of his charms as not only do you potentially have to deal with Dracula himself to get the loot, but there are many other monsters and hazards out to get you. After the introduction, you are presented with the above map which shows the layout of Dracula's tomb; each symbol representing various creatures, objects and traps. 'G' shows you were a Ghoul is lurking, 'Z' you'll find a zombie waiting for you. '?' is a mystery vault where there could either be something good or bad in there! I won't tell you the rest as this will be a nice surprise for you - tee hee! Ok, so one of them is a slime-pit. Once presented with the map, you have minimal time to memorise it as it is only displayed for a short period of time before it disappears. Well, you either have to memorise it or you have to be a dab hand at drawing maps. Personally, I tend to try and remember directions (N,S,E,W) as it's easier to remember and a damn sight easier to draw in ten seconds! Aside from the monsters (and slime-pits) you may find in the maze-like tomb, you'll also stumble across boxes of stakes. What good are stakes if Dracula isn't around, you may ask? Well, in this game they come in very handy. Should you enter a vault with a unpleasant being you'll be required to produce some stakes to save your life. This also applies to the aforementioned slime-pit (somehow) so collecting these is a must. Oh! So that's what it is! Looked more like a, um, blue thing with eyes. 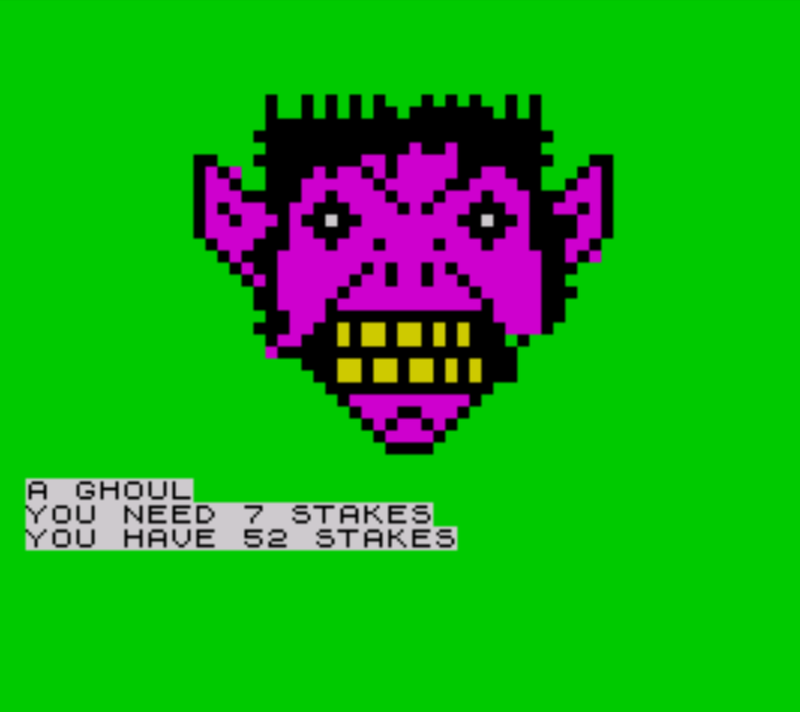 When you do come across a blue zombie or ghoul, you'll be presented with an image of said beast and then told how many stakes you need to survive. Not enough stakes = game over. Eek. Enough stakes, and the amount required is taken from your total so the more you find the better. Unless you want to get eaten by a zombie intentionally. Each to their own, but on a personal level I always find having more stakes to be better. Trust me on this. Ooh, how romantic ❤ Oh... I guess that's bad news. Once he's awake, he'll be moving from room to room like all other monsters and also, stakes will be required to fend him off should you happen to cross his path. Where he'll be - you won't know, unless of course you agree to sacrifice some stakes to take a look at your current position on the map, of which this option, the game will offer periodically as you progress. But then there's the worry of running out of stakes - have a look at the map, or save them for a monster? It's your choice, just make sure it's the right one. Personally, I like to go gung-ho and say 'no' to seeing the map and just try my luck hitting random directions; it adds a bit of surprise and tension to the game but if you're more conservative you may well take the option of looking at the map. Scaredy pants. A ghoul! Now there's a guy who needs a dentist. How do you escape Dracula's tomb? If you're lucky enough to evade enough monsters and gather some stakes along the way, you'll find yourself some stairs (ooh!) which lead to.....another level of monsters. Great! But dispair not, this is another opportunity to gather more riches before you can escape. Hey, I'm just trying to think of the positives here. Navigate your way from the second level of terror and ta-da, you're out of there with lots of treasure to take to the nearest jewellers to haggle a price with. Well done. Have I completed this game? Yes. Weirdly, only recently. Thinking I'd need to refresh my memory of the game before reviewing, I thought it best I give it a little go to make sure I'd not forgotten anything about it. Had a little play then lo and behold I'd made out alive! Even have the screenshot but won't share it so i don't spoil it for anyone. Anyway, I'm off for some therapy. Load it up and enjoy it yourself.........if you dare! !